Half price sales! Marks and Spencer vs Debenhams! Lets look at Marks and Spencer first. There are about 40 formal shirts in their sale, covering a decent range of styles. Would have been nice to see some more slim fit shirts in there, although there is the pictured item at a cool £15 - perfect if you want to make a great first impression when starting your job in the Marketing department of Ribena. Other than that, there are a couple of decent choices from their Collezione and Autograph ranges. So now Debenhams... All credit to Debenhams - their sale covers a pretty impressive range of formal shirts at a discount of 40%. That covers shirts by Jeff Banks, St George by Duffer, and Jasper Conran. There are swathes of formal shirts on offer at sub £20 prices and this really is a great chance to refresh to work wardrobe. 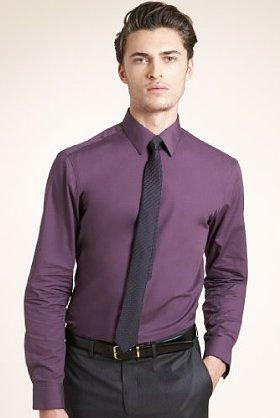 But my pick has to be this shirt and tie combo which is down from £42 to a bargain £25.20. Jeff Banks shirts are always great for comfort and well tailored, but with this spotted pink tie Debenhams has never been so metrosexual!